Background Recent studies have shown that pharmacists provide healthcare advice to pregnant women, and that they can play an important role in maternal care. However, pharmacists have faced challenges in advising mothers and coordinating with physicians. Objective To explore the experiences of community pharmacists in advising pregnant women at Lithuanian community pharmacies. Setting Community pharmacies in Lithuania. Methods Community pharmacists (n = 27) were recruited for semistructured face-to-face interviews from June 2012 to March 2013. A qualitative and descriptive study based on the content analysis approach was used for data collection and analysis. Main outcome measure Thematic coding of Lithuanian community pharmacist interview content. Results Three main areas emerged: topics of advice-giving, provision of information, and barriers to advice-giving. The question of whether to interact with the physician connected to all of these areas. Pharmacists described different practices about the advice they gave and how they gave it. Lack of knowledge and skills, both about pregnancy and about patient-physician-pharmacist interaction, were a clear barrier to care for pregnant women in community pharmacies. Conclusion Respondents were comfortable giving advice in clear situations, and found it challenging to do so otherwise. Improving the physician-pharmacist-patient communication environment and providing education and training programmes for pharmacists is necessary to reduce stress and to overcome barriers in advising pregnant women. We thank Professor T. Bondas, the reviewers, and the Santaka Valley for intellectual support. I want to thank you for taking the time to meet with me today. My name is S. G., and I would like to talk to you about your experiences advising pregnant women at the pharmacy. I am working at the Lithuanian University of Health Sciences, and the aim of this research is to disclose the pharmacists’ experience in advising pregnant women at pharmacies. The interview should take less than an hour. I will be taping the session because I don’t want to miss any of your comments. Although I will be taking some notes during the session, I can’t possibly write fast enough to get it all down. Because we’re on tape, please be sure to speak up so that we don’t miss your comments. All responses will be kept confidential. This means that your interview responses will only be shared with research team members, and we will ensure that any information we include in our report does not identify you as the respondent. Remember, you don’t have to talk about anything you don’t want to, and you may end the interview at any time. Are there any questions about what I have just explained? Would you agree to participate in this interview? World Health Organization. Jakarta Declaration on Leading Health Promotion into the 21st Century [Internet]. Jakarta: World Health Organization. 1997. (cited 2014 Apr 18). http://www.alliance-healthycities.com/htmls/glossary/pdf/jakarta_declaration_en.pdf. Ballard P, Radley A. Give it up for baby—a smoking cessation intervention for pregnant women in Scotland (Internet). (Scotland): Cases Public Health Commun Mark. 2009;3:147–160 (cited 2014 Apr 18). www.casesjournal.org/volume3. National Institute for Health and Clinical Excellence. Dietary interventions and physical activity interventions for weight management before, during and after pregnancy PH27 (Internet). London: National Institute for Health and Clinical Excellence. 2010 Jul (cited 2014 Apr 18). http://www.nice.org.uk/nicemedia/live/13056/49926/49926.pdf. 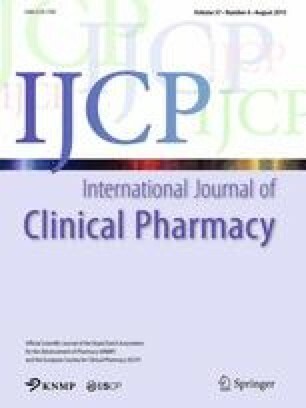 Jaradat N, Sweileh W. Drug Information for community pharmacies: survey on needs and use of drug information with special focus on new information technology (Internet). (Nablus): an-Najah National University. 2003;17:287–300 (cited 2014 Apr 18). http://staff.najah.edu/sites/default/files/2003.1.Drug%20Information%20for%20Community%20Pharmacies%20Survey%20on%20Needs%20and%20Use%20of.pdf. Hämeen-Anttila K, Jyrkkä J, Enlund H, Nordeng H, Lupattelli A, Kokki E. Medicines information needs during pregnancy: a multinational comparison. BMJ Open 2013;3. doi: 10.1136/bmjopen-2013-002594. Order of Lithuanian Minister of Health No. V-494 Approval of good pharmacy practice guidances. www.lrs.lt. Herbal/Traditional Products in Lithuania (Internet). Euromonitor International. 2014. (cited 2014 July 11). http://www.euromonitor.com/herbal-traditional-products-in-lithuania/report. Herbal/Traditional Products in Latvia (Internet). Euromonitor International. 2014. (cited 2014 July 11). http://www.euromonitor.com/herbal-traditional-products-in-latvia/report. Herbal/Traditional Products in Estonia (Internet). Eurominitor International. 2014. (cited 2014 July 11). http://www.euromonitor.com/herbal-traditional-products-in-estonia/report. Herbal/Traditional Products in Poland (Internet). Euromonitor International. 2014. (cited 2014 July 11). http://www.euromonitor.com/herbal-traditional-products-in-poland/report. Herbal/Traditional Products in the Netherlands (Internet). Euromonitor International. 2013. (cited 2014 July 11). http://www.euromonitor.com/herbal-traditional-products-in-the-netherlands/report. Herbal/Traditional Products in Denmark (Internet). Euromonitor International. 2014. (cited 2014 July 11). http://www.euromonitor.com/herbal-traditional-products-in-denmark/report. Herbal/Traditional Products in the United Kingdom (Internet). Euromintor International. 2014. (cited 2014 July 11). http://www.euromonitor.com/herbal-traditional-products-in-the-united-kingdom/report. International Pharmaceutical Federation (FIP). FIP reference paper on the effective utilization of pharmacists in improving maternal, newborn and child health (MNCH) (Internet). (Dublin): FIP Council. 2013. (cited 2014 Apr 21). http://www.fip.org/www/uploads/database_file.php?id=343&table_id=.